A carpet is a heavy fabric usually used as a floor covering, although it may also be used for table and wall coverings. The hand-knotted pile carpet has been traced back to Central Asia between the third and second millennium B.C.E. Carpets are made of natural and synthetic fibers, such as wool, nylon, polyester, and polypropylene. Traditionally, they were woven by hand, but today most carpets are machine-made. By incorporating a variety of colors and patterns, carpets are made to be aesthetically pleasing as well as offering functional value. 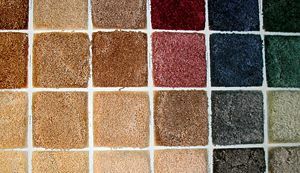 Swatches of commercially made Berber carpet. 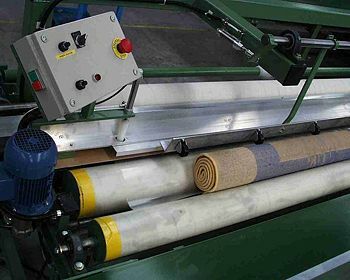 A typical machine used to cut and re-roll carpet lengths for installation delivery. The woven carpet is produced on a loom similar to woven cloth and is a cut pile. Normally, many colored yarns are used and this process is capable of producing intricate patterns from predetermined designs. These carpets are normally the most expensive. Needlefelt carpets are technologically more advanced. They are produced by electrostatic attraction of individual synthetic fibers forming an extremely durable carpet. These carpets are normally found in the contract market (such as hotels), where there is a lot of traffic. On a knotted pile carpet (formally, a supplementary weft cut-loop pile carpet), the structural weft threads alternate with a supplementary weft that rises at right angles to the surface of the weave. This supplementary weft is attached to the warp by one of three knot types (see below), such as shag which was popular in the 1970s, to form the pile or nap of the carpet. Both flat and pile carpets are woven on a loom. Both vertical and horizontal looms have been used in the production of European and Oriental carpets in some colors. The warp threads are set up on the frame of the loom before weaving begins. A number of weavers may work together on the same carpet. A row of knots is completed and cut. The knots are secured with (usually 1 to 4) rows of weft. There are several styles of knotting, but the two main types of knot are the symmetrical (also called Turkish or Ghiordes) and asymmetrical (also called Persian or Senna). Contemporary centers of oriental carpet production are: Iran (Tabriz), Afghanistan, Azerbaijan, India, Turkey, Northern Africa, Pakistan, Nepal, Spain, Turkmenistan, and Tibet. The importance of carpets in the culture of Turkmenistan is such that the national flag features a vertical red stripe near the hoist side, containing five carpet guls (designs used in producing rugs). Child labor has often been used in Asia. In response, the Rugmark Foundation offers a labeling scheme that is used throughout Europe and North America. The foundation inspects the looms of companies and certifies that child labor has not been used. Importers pay for the labels, and the revenue collected is used to monitor centers of production and educate previously exploited children. Unlike woven carpets, embroidery carpets are not made on a loom. Their pattern is established by the application of stitches to a cloth (often linen) base. The tent stitch and the cross stitch are two of the most common. Embroidered carpets were traditionally made by royal and aristocratic women in the home, but there has been some commercial manufacture since steel needles were introduced (earlier needles were made of bone) and linen weaving improved in the sixteenth century. Mary Stewart Queen of Scots is known to have been an avid embroiderer. Sixteenth-century designs usually involve scrolling vines and regional flowers (for example, the Bradford carpet). They often incorporate animal heraldry and the coat of arms of the maker. Production continued through the nineteenth century. Victorian embroidered carpet compositions include highly illusionistic, three-dimensional flowers. Patterns for tiled carpets made of a number of squares, called Berlin wool work, were introduced in Germany in 1804, and became extremely popular in England in the 1830s. Carpets can be made from many single or blended natural and synthetic fibers. Fibers are chosen for durability, appearance, ease of manufacture, and cost. The most important yarn constructions are noted below. Wool and wool blended with synthetic fibers: Wool has excellent durability, can be dyed easily and is fairly abundant. When blended with synthetic fibers such as nylon the durability of wool is increased. Blended wool yarns are extensively used in production of modern carpet. Wool is relatively expensive. Nylon: This is the most popular synthetic fiber used in carpet production. Nylon can be dyed topically or dyed in a molten state (solution dying). Nylon can be printed easily and has excellent wear characteristics. In carpets Nylon tends to stain easily because it possesses dye sites on the fiber. These dye sites need to be filled in order to give Nylon any type of stain resistance. As nylon is petroleum-based it varies in price with the price of oil. Polypropylene: This polymer is used to produce carpet yarns because it is cheap, although it is difficult to dye and does not wear as well as wool or nylon. Large looped Berber carpets made from this fiber are usually only suited for light domestic use and tend to mat down quickly. Berber carpets with smaller loops tend to be more resilient and retain their new appearance longer than large looped Berber styles. Commercial grade level-loop carpets have very small loops, and commercial grade cut-pile styles are well constructed. When made with polypropylene (also called Olefin) these styles wear very well, clean easily and are suitable for areas with heavy foot traffic such as offices. Commercial grade carpets can be glued directly to the floor or installed over a 1/4" thick, 8-pound density padding. Outdoor grass carpets are usually made from polypropylene. Polyester: Polyester Also known as "PET" is used in carpet manufacturing in both spun and filament constructions. After the price of raw materials for many types of carpet rose in the early 2000s, polyester became more competitive. Polyester has good physical properties and is inherently stain-resistant because it is hydrophobic, and, unlike nylon, does not have dye sites. Color is infused in a molten state (solution dyeing). Polyester has the disadvantage that it tends to crush or mat down easily. It is typically used in mid- to low-priced carpeting. PTT: PTT (Polytrimethylene terephthalate) polymer, also called Sorona or 3GT (Dupont)or Corterra (Shell), is a variant of Polyester. Lurgi Zimmer PTT was first patented in 1941, but it was not produced until the 1990s, when Shell Chemicals developed the low-cost method of producing high-quality 1,3 propanediol (PDO), the starting raw material for PTT Corterra Polymers. PTT is similar to Polyester, but its molecules have a "kink," similar to a spring, that makes the fiber more crush resistant, resilient, and easy to clean. PTT also does not have dye sites, and is inherently stain resistant because color is infused in a molten state. Carpets made with PTT dry quickly and are resistant to mold. The binding in woven carpet is usually cotton, and the weft is jute. Carpet binding is a term used for any material being applied to the edge of a carpet to make a rug. Carpet binding is usually cotton or nylon, but also comes in many other materials, such as leather. Natural binding, in other words, binding not made from synthetic material is frequently used with bamboo fibre, grass, and wool rugs, but is often used with carpet made from other materials. 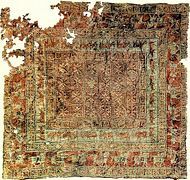 The Pazyryk Carpet, among the oldest surviving carpets in the world. The hand-knotted pile carpet probably originated in southern Central Asia between the third and second millennium B.C.E. Carpet-making was introduced to Spain in the tenth century by the Moors. The Crusades brought Turkish carpets to all of Europe, where they were primarily hung on walls or used on tables. Only with the opening of trade routes in the seventeenth century were significant numbers of Persian rugs introduced to Western Europe. The earliest surviving pile carpet in the world is called the "Pazyryk Carpet," dating from the fifth to fourth century B.C.E. It was excavated by Sergei Ivanovich Rudenko in 1949 from a Siberian burial ground where it had been preserved in ice in the valley of Pazyryk. The origin of this carpet is attributed to either the Siberian Turkic groups, Scythians or the Persian Achaemenids. This carpet is 200 x 183 cm (6'6" x 6'0") and has 360,000 knots/m². The earliest group of surviving knotted pile carpets was produced under Seljuk rule in the first half of the thirteenth century on the Anatolian peninsula. The 18 extant works are often referred to as the Konya Carpets. The central field of these large carpets is a repeated geometrical pattern. The borders are ornamented with a large-scale, stylized, angular calligraphy called Kufic, pseudo-Kufic, or Kufesque. Carpets, whether knotted or flat woven (kilim) are among the best known art forms produced by the Turks from ancient times. There are environmental, sociological, economic, and religious reasons for the widespread art of carpet weaving among the Turkish people from Central Asia to Turkey. The geographical regions where Turks have lived throughout the centuries lie in the temperate zone. Temperature fluctuations between day and night, summer and winter may vary greatly. Turks—nomadic or pastoral, agrarian or town-dwellers, living in tents or in sumptuous houses in large cities—have protected themselves from the extremes of the cold weather by covering the floors, and sometimes walls and doorways, with carpets. The carpets are always handmade of wool or sometimes cotton, with occasional additions of silk. These carpets are natural barriers against the cold. The flat woven kilims, which are frequently embroidered, are used as blankets, curtains, and covers over sofas or as cushion covers. In general, Turks take their shoes off upon entering a house. Thus, the dust and dirt of the outdoors are not tracked inside. The floor coverings remain clean, and the inhabitants of the house, if need be, can comfortably rest on the floor. In traditional households, women and girls take up carpet and kilim weaving as a hobby as well as a means of earning money. Even technological advances that promoted factory-made carpets could not hamper the production of rug weaving at the cottage-industry level. Although synthetic dyes have been in use for the last 150 years, handmade carpets are still considered far superior to industrial carpeting. Turkish carpets are among the most sought after household items all over the world. Their rich colors, warm tones, and extraordinary patterns with traditional motifs have contributed to the status that Turkish carpets have maintained since the thirteenth century. Marco Polo, who traveled through Anatolia in the late thirteenth century, commented on the beauty and artistry of the carpets. A number of carpets from this period, known as the Seljuk carpets, were discovered in several mosques in central Anatolia. These were under many layers of subsequently placed carpets. The Seljuk carpets are today in the museums in Konya and Istanbul. Turkish carpets in the fifteenth and sixteenth centuries are best known through European paintings. For example, in the works of Lotto (fifteenth-century Italian painter) and Holbein (sixteenth-century German painter), Turkish carpets are seen under the feet of the Virgin Mary, or in secular paintings, on tables. In the seventeenth century, when the Netherlands became a powerful mercantile country, Turkish carpets graced many Dutch homes. The Dutch painter Vermeer represented Turkish carpets predominantly to indicate the high economic and social status of the persons in his paintings. Turkey carpets, as they were known, were too valuable to be put on floors, except under the feet of the Holy Mother and royalty. Anyone who enters a mosque is required to remove his/her shoes. The mosque is the common house of a Muslim community, therefore, shoes are cast off before the door. Moreover, the ritual of prayer requires the faithful to kneel and touch the ground with one's forehead in humility before God. There are no chairs or benches in a mosque, only carpets. A Turkish mosque is often covered from wall to wall with several layers of carpets. The Turkish carpets have exuberant colors, motifs, and patterns. No two carpets are the same; each one is a unique creation. Because traditionally women have woven the carpets, this is one art form that is rarely appreciated as being the work of a known or specific artist. Nevertheless, Turkish women silently continue to create some of the most stunning examples of works of art to be distributed all over Turkey and the world. The Persian carpet is an essential part of Persian (Iranian) art and culture. Carpet-weaving is one of the most distinguished manifestations of Persian culture and art, and dates back to the Bronze Age. The earliest surviving corpus of Persian carpets come from the Safavid dynasty (1501-1736) in the sixteenth century. However, painted depictions prove a longer history of production. There is much variety among classical Persian carpets of the sixteenth and seventeenth centuries. Common motifs include scrolling vine networks, arabesques, palmettes, cloud bands, medallions, and overlapping geometric compartments rather than animals and humans. This is because Islam, the dominant religion in that part of the world, forbids their depiction. Still, some show figures engaged either in the hunt or feasting scenes. The majority of these carpets are wool, but several silk examples produced in Kashan survive. The art of weaving developed in the region comprising Pakistan at a time when few other civilizations employed it. Excavations at Mohenjo-daro and Harappa—ancient cities of the Indus Valley civilization—have established that the inhabitants used spindles and spun a wide variety of weaving materials. Some historians consider that the Indus Valley civilization first developed the use of woven textiles. Carpet weaving may have been introduced into the area of present-day Pakistan as far back as the eleventh century with the coming of the first Muslim conquerors, the Ghaznavids and the Ghauris, from the West. It can with more certainty be traced to the beginning of the Mughal Dynasty in the early sixteenth century, when the last successor of Timur, Babar, extended his rule from Kabul to India to found the Mughal Empire. Under the patronage of the Mughals, Indian craftsmen adopted Persian techniques and designs. Carpets woven in the Punjab at that time (often called Lahore carpets today) made use of motifs and decorative styles found in Mughal architecture. During the Mughal period, the carpets made on the Indian subcontinent became so famous that demand for them spread abroad. These carpets had distinctive designs and boasted a high density of knots. Carpets made for the Mughal emperors, including Jahangir and Shah Jahan, were of the finest quality. Under Shah Jahan's reign, Mughal carpet weaving took on a new aesthetic and entered its classical phase. Oriental carpets began to appear in Europe after the Crusades in the eleventh century. Until the mid-eighteenth century, they were mostly used on walls and tables. Except in royal or ecclesiastical settings they were considered too precious to cover the floor. Starting in the thirteenth century, oriental carpets begin to appear in paintings, notably from Italy, Flanders, England, France, and the Netherlands. Carpets of Indo-Persian design were introduced to Europe via the Dutch, British, and French East India Companies of the seventeenth and eighteenth centuries. Although isolated instances of carpet production pre-date the Muslim invasion of Spain, the Hispano-Moresque examples are the earliest significant body of European-made carpets. Documentary evidence shows production beginning in Spain as early as the tenth century C.E. The earliest extant Spanish carpet, the so-called Synagogue carpet, is a unique survival dated to the fourteenth century. The earliest group of Hispano-Moresque carpets, Admiral carpets (also known as armorial carpets), has an all-over geometric, repeat pattern punctuated by blazons of noble, Christian Spanish families. The variety of this design was analyzed most thoroughly by May Beattie. Many of the fifteenth-century Spanish carpets rely heavily on designs originally developed on the Anatolian Peninsula. Carpet production continued after the Reconquest of Spain and eventual expulsion of the Muslim population in the fifteenth century. Sixteenth-century Renaissance Spanish carpet design is a derivative of silk textile design. Two of the most popular motifs are wreaths and pomegranates. Pierre-Josse Perrot is the best-known of the mid-eighteenth-century carpet designers. His many surviving works and drawings display graceful rococo s-scrolls, central rosettes, shells, acanthus leaves, and floral swags. The Savonnerie manufactory was moved to the Gobelins in Paris in 1826. The Beauvais manufactory, better known for their tapestry, also made knotted pile carpets from 1780 to 1792. Carpet production in small, privately owned workshops in the town of Aubusson began in 1743. Carpets produced in France employ the symmetrical knot. Knotted pile carpet weaving technology probably came to England in the early sixteenth century with Flemish Calvinists fleeing religious persecution. Because many of these weavers settled in South-eastern England in Norwich, the 14 extant sixteenth- and seventeenth-century carpets are sometimes referred to as "Norwich carpets." These works are either adaptations of Anatolian or Indo-Persian designs or employ Elizabethan-Jacobean scrolling vines and blossoms. All but one are dated or bear a coat of arms. Like the French, English weavers used the symmetrical knot. There are documented and surviving examples of carpets from three eighteenth-century manufactories: Exeter (1756-1761, owned by Claude Passavant, 3 extant carpets), Moorfields (1752-1806, owned by Thomas Moore, 5 extant carpets), and Axminster (1755-1835, owned by Thomas Whitty, numerous extant carpets). Exeter and Moorfields were both staffed with renegade weavers from the French Savonnerie and, therefore, employ the weaving structure of that factory and Perrot-inspired designs. Neoclassical designer Robert Adam supplied designs for both Moorfields and Axminster carpets based on Roman floor mosaics and coffered ceilings. Some of the most well-known rugs of his design were made for Syon House, Osterley Park House, Harewood House, Saltram House, and Newby Hall. Six of Axminster carpets are known as the "Lansdowne" group. These have a tripartite design with reeded circles and baskets of flowers in the central panel flanked by diamond lozenges in the side panels. Axminster Rococo designs often have a brown ground and include birds copied from popular, contemporary engravings. Carpets will forever be associated with the town of Kidderminster in Worcestershire, United Kingdom. This was the heart of the UK carpet industry throughout the industrial revolution, and has a carpet museum of memorabilia related to hand weaving. Even now, a large percentage of the 55,000 population town still seek employment in this industry. The town of Wilton, Wiltshire is also known for its carpet weaving, which dates back to the eighteenth century. Macro shot of Berber carpet. Berber carpets are a style of carpet containing big and small tufts. It uses a cut pile construction type, and usually contains small flecks of dark color on lighter shade background colors. Carpeting is an attached floor covering made of a heavy, thick fabric, usually woven or felted, often wool, but also cotton, hemp, straw, or a synthetic counterpart. Polypropylene, commonly called Olefin, is a very common pile yarn, as is nylon. It is typically knotted or glued to a base weave. It is made in breadths of 12 or 15 feet (2m, 3 m or 4 m outside the USA) to be cut, seamed with a seaming iron and seam tape (formerly it was sewn together) and affixed to a floor over a cushioned underlay (pad) using nails, tack strips (known in the UK as carpet rods or stair rods, when used on stairs), (gripper) or adhesives, thus distinguishing it from a rug or mat which are loose-laid floor coverings. For environmental reasons, the use of organic wool, natural bindings, natural padding, and formaldehyde-free glues is becoming more common. These options are almost always at a premium cost. In the UK, carpets are still manufactured for Pubs & Clubs in a narrow width of 27" (0.69m) and is then sewn to size. Carpeting that covers an entire room area is loosely referred to as 'wall-to-wall,' but carpet can be installed over any portion thereof with use of appropriate transition moldings where the carpet meets other types of floor coverings. Carpeting is more than just a single item; it is, in fact, a system comprising the carpet itself, the carpet backing (often made of latex), the cushion, and a method of installation. 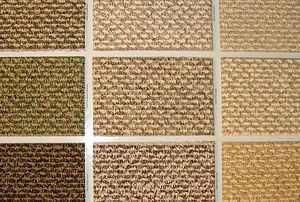 'Carpet tiles' are squares of carpet, typically 0.5 m square, that is melted into high-density vinyl that can be used to cover a floor. They are usually only used in commercial settings and are affixed using a special pressure sensitive glue, which holds it into place while allowing easy removal (in an office environment, for example), or to allow rearrangement in order to spread wear. Modern carpeting is often attached to the floor (or stairways) of a building and, when considered permanently attached, would be part of the real property that includes the building. ↑ Child-Labor-Free Certification. Rugmark Foundation. Retrieved December 8, 2008. ↑ Prehistoric Art: Early Nomads of the Altaic Region. hermitagemuseum.org. Retrieved December 21, 2008. ↑ Valérie Bérinstain, Susan Day, et al. 1996. Great Carpets of the World. (New York: Vendome Press. ISBN 0500017603). ↑ Arthur Upham Pope, Phyllis Ackerman, and Theodore Bestermann. 1938. A Survey of Persian Art from Prehistoric Times to the Present. (London: Oxford University Press.) OCLC 1360511. ↑ Peter F. Stone. 1997. The Oriental Rug Lexicon. (Seattle: University of Washington Press. ISBN 0295975741). Aslanapa, Oktay. 1988. One Thousand Years of Turkish Carpets, Translated and edited by William A. Edmonds. Istanbul: Eren. Bérinstain, Valérie, Susan Day, et al. 1996. Great Carpets of the World. New York: Vendome Press. ISBN 0500017603. Carpet and Rug Institute. 1995. The Carpet Primer. Dalton, GA: Carpet and Rug Institute. ISBN 0892750537. Eiland Jr., Murray L., and Murray Eiland III. 1998. Oriental Carpets: A Complete Guide, 4th ed. Boston: Little, Brown. ISBN 0821225480. Fletcher, Alan J. 2008. The Complete Carpet Buying Guide. Portland OR: AJ Books. ASIN B00190JFE2. Metropolitan Museum of Art (New York, NY), Maurice Sven Dimand, and Jean Mailey. 1973. Oriental Rugs in the Metropolitan Museum of Art. New York: Distributed by New York Graphic Society, Greenwich, CT. ISBN 0870991248. Pope, Arthur Upham, Phyllis Ackerman, and Theodore Bestermann. 1938. A Survey of Persian Art from Prehistoric Times to the Present. London: Oxford University Press. OCLC 1360511. Sherrill, Sarah B. 1996. Carpets and Rugs of Europe and America. New York: Abbeville Press. ISBN 1558593837. Stone, Peter F. 1997. The Oriental Rug Lexicon. Seattle: University of Washington Press. ISBN 0295975741. This page was last modified on 16 January 2017, at 17:19.